I'm sure I don't need to tell you how important a good cleanse is, especially at the end of the day when you need to remove all the makeup, spf, pollution etc etc. This is when you're going to want to do a really thorough job and crack out the double cleanse. I'm using a combination of products for my double cleanse right now that I'm loving so much I just had to share it with you. 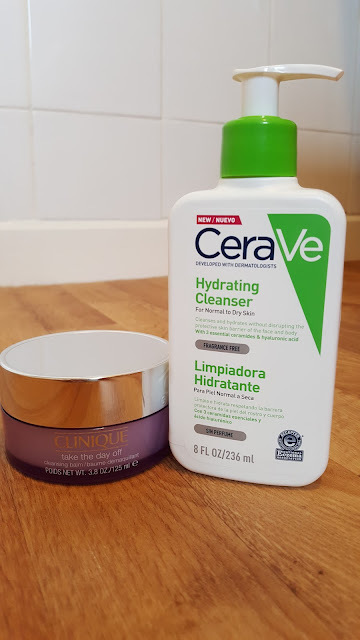 Now I realise that neither the Clinique Take The Day Off Cleansing Balm or the CeraVe Hydrating Cleanser are going to be new to most people but hear me out as this combination has so many things going for it. First off, they should both be pretty easy to get hold of. Clinique is available from a range of stockists and now even those in the UK can get hold of CeraVe thanks to Boots. Hurrah for that! Affordability is also a big plus. CeraVe are famed for their fuss-free budget staples and, even though the Clinique is a little pricier, it is still very affordable for a cleansing balm. You only need a little bit so the pot should last you a good while. They are both suitable for pretty much all skin types. I have combination skin which is left feeling really hydrated but without overloading my oily t-zone. If you are sensitive to fragrance then you are covered too as these two products are both fragrance free. Finally, and most importantly, they are super effective. Step one is the Clinique Take The Day Off Cleansing Balm. I'm a big cleansing balm fan and this might just be my all-time favourite. As it warms on your skin it turns into a silky-smooth oil which just melts away makeup. As it's fragrance free I can even rub it right over my lashes without it stinging my eyes which is a huge plus for me as I can't really be bothered with using a separate eye makeup remover. You can either emulsify it with a bit of water and it will turn milky or just go straight in with your preferred method of removal (I like to use a microfiber face cloth). Some cleansing balms or oils can leave behind a greasy residue but this one doesn't at all. Onto step two which is the Cerave Hydrating Cleanser. This is a light and refreshing non-foaming lotion which contains goodies such as hyaluronic acid and ceramides. As well as being a great option for a second cleanse it's also perfect for the morning. It's non-stripping, utterly faff-free, and comes in a big pump bottle for a budget friendly price. I feel like everyone should own one. My skin is left feeling soft, supple and primed for the rest of my evening routine. At the time of writing the Clinique Take The Day Off Cleansing Balm 125ml is £24 HERE and the CeraVe Hydrating Cleanser 236ml is £9 HERE.